The Montana spirit is alive and well in Kalispell, where spectacular mountains, rivers and lakes are equaled only by the innovative spirit of the people who live there. 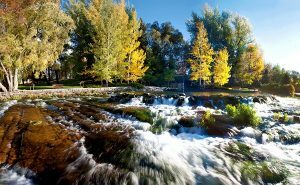 Kalispell has long been the gateway to Glacier National Park and a beautiful oasis in the midst of Northwest Montana’s wilderness that has drawn visitors for more than a century since the country’s first train line to the west coast was built through town. 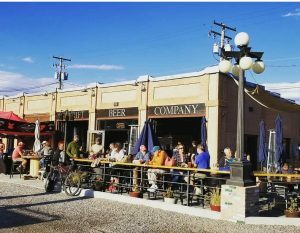 Today, visitors are still flocking to Kalispell, and in larger numbers than ever (although most of them now arrive via Glacier Park International Airport), and when they arrive in town they’re greeted by old West charm intermingled with modern amenities, abundant hospitality, and a thriving and fast-growing craft beer scene. behind each one of those breweries during a daylong exploration of wild and wonderful Northwest Montana. 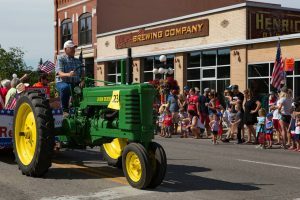 A look down Main Street in Kalispell harkens back to the days of railway workers, homesteaders, ranchers, and more who first arrived here while the Empire Builder line made its way from Chicago to Seattle. Some buildings in downtown date back to the late 19th century, and a handful of historic businesses still operate here, including a 100-year-old bike shop (Wheaton’s), classic soda fountain (Norm’s News), a peanut-shell-littered saloon serving tasty pizzas (Moose’s) and an ornate place to lay your head (Kalispell Grand Hotel). Kalispell Brewing Co., right on Main Street, opened five years ago in one of those historic buildings, and from the outside the brewery still retains its classic charm. But inside, the place buzzes with young professionals tipping one back after work, enjoying live music, tasting food from a nearby food truck, or trying their hand at weekly trivia. And the rest of downtown includes two other breweries — SunRift and Bias — along with artesian bakeries, funky coffee shops, and boutique clothing and jewelry stores. Great Northern Brewing Co. opened in 1995 in nearby Whitefish, and since then breweries have been popping up all over the valley. Each one is locally owned, and each one pays homage to Northwest Montana in a unique way. 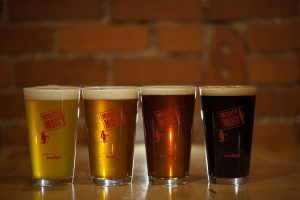 All take advantage of abundant local ingredients, and a handful of beers at each brewery carry a locally inspired name like the Camp Misery Imperial Stout (Flathead Lake Brewing), Going to the Sun IPA (Great Northern), Good Med Montana Red Ale (Great Northern), The Bob IPA (Sacred Waters) and Big Arm Strong Golden Ale (SunRift). Flavors are all over the map here, too, offering more than just delicious Northwest IPAs. Bias Brewing in particular specializes in unique tastes and experimental beers, including sours and a delightful tea ale, and one of Kalispell Brewing’s most popular options is the Winter at Noon Dunkel. Great Northern also pays homage to one of the region’s most abundant (and delicious) plants with its Wild Huckleberry Lager. The June 9 event begins with a trip over the Rocky Mountain Front from Great Falls and into Glacier National Park, where attendees will enjoy lunch and a weather-appropriate outdoor adventure. Afterward, it’s on to downtown Kalispell for a scavenger hunt ending at the Beer Now Brewfest where representatives from Flathead Valley breweries will be on-site for tastings and networking, and dinner will be provided by a variety of local food trucks. 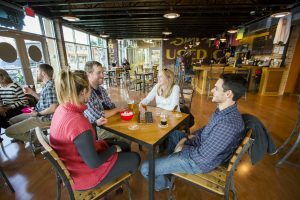 The evening also includes live music and ample opportunity for barstool chats with industry reps.
Head to https://discoverkalispell.com/day-trips/brews-wines/ to learn more about Kalispell, Montana and the craft beer scene in Northwest Montana. The reasons to pair fromage and beer are endless, especially given the ubiquity of great French cheeses and craft beers. However, with great fromage and beer comes great responsibility. Unlike wine, beer has a bigger range of flavor, which opens up a new world of unexpected, delicious pairings. From washed rind cheeses and blues to IPAs and farmhouse ales, pairing cheese and beer might seem overwhelming, but it need not be complex. So, rather than making cheese and beer pairing a science, here are three quick tips to get you started. The secret to enjoying fromage and beer is to avoid overpowering either. When you pair similar intensity cheeses you’ll be able to taste both clearly and enjoy their subtleties. For example, when you pair a milder cheese like Brie with a strong IPA, the flavor is going to be mostly the IPA! A good rule of thumb is to match the intensity of mild cheeses with light beers and strong cheeses with strong beers so you bring out the best in both. As with intensity, it helps to consider the texture of the cheese in relation to the consistency of the beer. 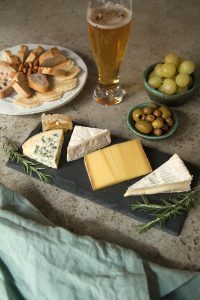 With softer, creamier cheeses that coat the mouth like triple crème or Brie, a more effervescent beer like a pilsner or lager will cut through the higher butterfat content and highlight the rich flavors. On the contrary, harder cheeses like Mimolette or Comté, warrant a less effervescent beer like a cask ale, stout, or porter. Typically, the higher the butterfat content, the higher the chance a more bubbly beer will pair well. Before you buy your fromage, think about what kinds of beer you like. If you like darker, heavier beers like Belgian ales or IPAs, then strong cheeses like Epoisses or Pont L’Évêque will be good matches. Or, if you’re into blond ales and pilsners, Emmental or Brie might work best. Ultimately, there are no hard and fast rules with fromage and beer. If it’s fermented and you enjoy it, you should pair it. Although there are no rigid rules, here are some recommended pairings that are guaranteed to be magnifique. For more fromage secrets, recipes, and tips visit www.cheesesofeurope.com or download the Cheeses of Europe app. Helena charms, just like the state she is capital to. The city lures visitors to return, for a modern-day romance with the American West, as it was, and still is—only better. As novelist John Steinbeck gushed, “I am in love with Montana. For other states I have admiration, respect, recognition, even some affection. But with Montana, it is love. Sponsored post: This post was written and submitted by our conference sponsor, Visit Helena who is hosting a Beer Now 19 pre-con excursion! Check them out on Facebook and Instagram! 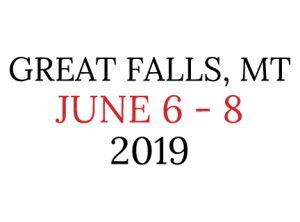 The Beer Bloggers & Writers Conference is rebranding as Beer Now and has announced it will take place in 2019 in Great Falls, Montana with a date of June 6 – 8 and a focus on “adventure and beer” for its 10th anniversary. We are extremely proud to be bringing Beer Now to the great state of Montana and the wonderful city of Great Falls, with a date of June 6 – 8, 2019, to celebrate our 10th anniversary. We love Montana as much as we love bloggers. Zephyr Conferences is based in the small town of Red Lodge. Reno and Ryan on our conference team live in Bozeman and Missoula. Our sister company, Zephyr Adventures, runs tours in Montana each year. Yes, we are smitten with this, the fourth largest state in the country with only just over a million inhabitants. And we think you will love it too. Not only is Montana great for outdoor adventures such as hiking, mountain biking, fly fishing, and river rafting but it is a hotbed of beer, with the second highest density of brewers in the United States. And for 2018, we will be combining this with our regular outstanding content, excellent beer, Montana hospitality, and outdoor adventure excursions. Our host city, Great Falls, is located on the Missouri River and is the most centrally-located major city in the state. It is throwing out the welcome wagon with two great beer dinners and lots of local brews. Thank you to Visit Great Falls Montana for organizing this welcome to beer writers and influencers everywhere. And to include a little adventure, we are organizing a pre-conference and a post-conference excursion, each of which will include outdoor activities as well as visits to area breweries. Details to come. Registration is open now and we hope you can join us!